Since Milton Friedman we have all become monetarists. In order to raise inflation it will be necessary to increase the growth rate of the money stock. This requires that the ECB increase the money base. And to achieve the latter there is only one practical instrument, ie, an open-market purchase of government bonds. There is no other way to raise inflation than through an increase in the money base and a bond-buying programme is the time-tested way to achieve this. There, you see? 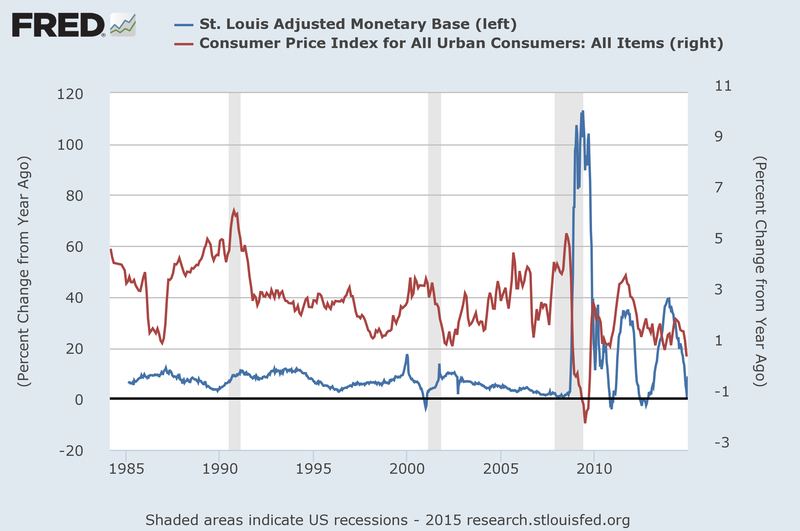 When the monetary base (blue line) goes up, then the inflation rate goes up! If you look at it hard enough and long enough and mumble “theory beats reality” while you do it then the relationship is there! If you would stand back and observe, you would see that the up and down in the monetary base (blue line) from 2010 until basically now did not even correlate with movements of inflation in the same direction. Since 2012, inflation in the US has been stable while the monetary base moved first up and then down. Jumping to the conclusion that a rise in the monetary base causes inflation is something which I find not justified by the data. But I think it’s also important to note that Friedman was all wrong about Japan — and that you can argue that he was also wrong about the Great Depression, for the same reason. For what Friedman argued, both for Japan in the 1990s and America in the 1930s, was that all the central bank needed to do was more — push out those reserves into the banking system. This would raise the money supply, and a higher money supply would have the usual effects. (I did not copy&paste the chart because I don’t know about the copyright issue.) On the chart you can see that in Japan, which also did QE, saw some periods of high monetary base growth, by something like 30% around 2002, for instance. Japan, however, is know as a stagnation economy bordering on deflation. There is no evidence at all that QE led to higher inflation rates. Quite the opposite. Taiwanese-born and Japanese-raised economist Richard Koo has written a new book on the lessons of Japan named “The Escape from Balance Sheet Recession and the QE Trap: A Hazardous Road for the World Economy“. So, we’re not all monetarists. Let’s look at the balance sheets then, shall we? With quantitative easing, the central banks creates additional deposits for banks as it buys some of their assets, like bonds. What can banks do with these reserves? They can lend them out to other banks, but that is not very likely since all banks will receive additional reserves and none will lose some. Banks can use reserves to buy financial assets, but this would increase their exposure to risk since they would have to take any losses resulting from this business. Plus the reserves are moved to the balance sheets of another bank, so we’re still unsure of where they go. In the end, the banks will move the reserves into the deposit facility at the ECB, which offers a fantastic interest rate of -0.2%. And this creates inflation how? Bank loans are created by banks when they mark up the deposits of their client and simultaneously create an item called loan on the asset side of their balance sheet. Banks do not need reserves to make loans, which should by now by common knowledge among macroeconomists. The BoE says so, Knut Wicksell wrote about in his 1898 classic Interest and Prices, and Post-Keynesians have been acknowledging it for decades. The monetary circuit in the euro zone is damaged, because the private sector repays net debt. This destroys deposits, which are not available for spending. We need additional deposits to grow faster. DeGrauwe confuses deposits in the central bank (reserves) with deposits in banks. Only the latter can lead to more spending and hence more inflation. Banks owning more central bank deposits will not be able to spend them on goods and services produced. QE was a failure in Japan, in the US, and the UK. It will be a failure in the euro zone as well. The only thing it does is to lower the long-term yields, but given that firms have problems with demand this will not be the cure of the aggregate demand weakness that is hurting the euro zone so much. « The rise of the Swiss Franc – the fall of Osnabrück? If the securities acquired by the ECB are held by banks, you are correct. If they are however held in the non-banking sector, than of course the sale of these securities will increase the size of the deposits. The question then is, what these deposits will be used for. Presumably, they will neither be used for investments nor for consumption, but for the purchase of financial assets.